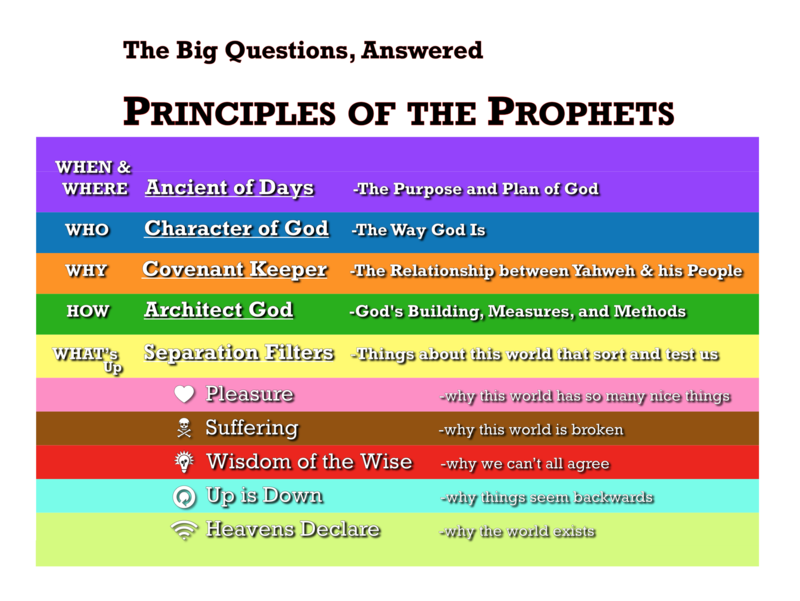 I love it when all the Principles of the Prophets, or the whole Rainbow Scaffold, is found in one passage. (If you are unaware of my ongoing Mene Mene Tekel Upharsin Video series, click here for an overview). Here, in Matthew, just before the events of Passion Week, Christ has a final word. He lays it all out. The Lord begins this section with WOES upon the scribes and the Pharisees. Starting here, he tags each of the Rainbow Strand principles. The OT Woes against Israel and the nations around at the time were saturated in these same ideas: beware, Judgment Day is nigh. The measures God uses to weigh and test the heart are laid out by Christ here in Matthew. Christ is saying what had been said all along. Jesus begins this passage by supporting both Scripture and the teaching of it. 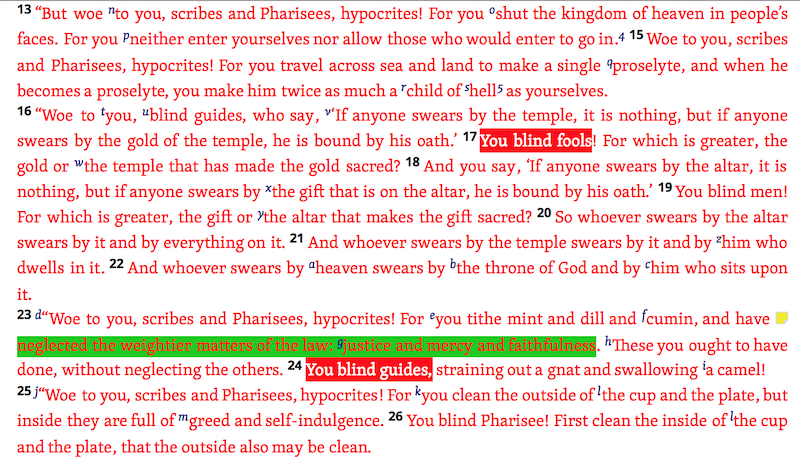 But he criticizes the methods of the scribes and Pharisees. They burdened the people with “hard to bear” weight of obedience without understanding the heart of the law. For the Pharisees, deeds made you right before God. The Lord Jesus counters this idea here and in the following two chapters. He teaches rather that your actions and intentions reveal whether or not you love God. They do not in themselves make you right with God. True good deeds are proof of the presence of something else: love. The Pharisees attempted to be justified by their deeds, but the opposite resulted: a righteousness contest they would automatically fail. Proverbs 16:18 says simply: “Pride comes before a fall and a haughty spirit before destruction” (Up is Down, light blue) . 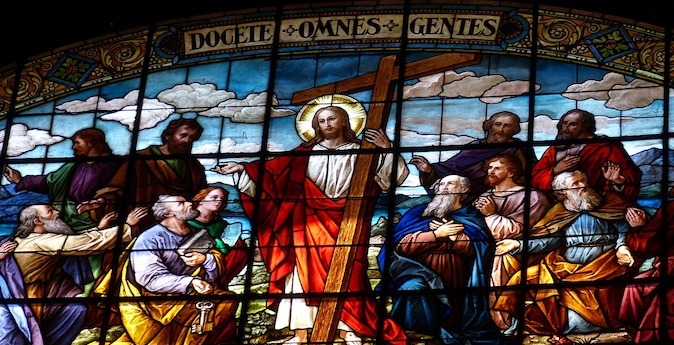 Christ begins this diatribe with an attack on pride, commending humility before God. Many verses in Scripture repeat this idea: by going DOWN, in humility and repentance, we will find grace in the sight of God. Or do you find in his words an ECHO of the Prophets? Do you look inside yourself and hunt down your hypocrisy and your dead-bones? Do his words bring you to your knees in fear and trembling? What does your attitude say about you? Before God are you full of pride and self-confidence or full of humility and repentance? The world values something different than humility. Light was the first thing God spoke into being. “Let there be light,” (Gen 1:1-3). John 1 shows that the WORD and TRUTH was also LIGHT. And when Paul was chastised and called to repentance on the road to Emmaus, he was struck blind to show he was missing the light of truth. True wisdom aligns itself with God’s revelation, including truth of Christ. On the other hand, the World’s Wisdom broadcasts what is contrary to God and his principles. And yet he offers them hope. He gives instruction for how to come to the light: “Clean the inside of the cup,” (light blue again!). For if they go UP in pride, continuing on that path, they will go DOWN, proving they are “a child of hell” (v.15). Up is Down but Down is Up.